Her Holiness, Godly Personified, with unlimited heavenly powers, Mata Lal Devi Ji is popularly known as "Pujya Mata ji" among her devotees. In her own words, "I am Dharam Maa to all those, who come to visit this temple and Almighty has destined me to serve them all". This version of Pujya Mata Ji shows her greatness and unquestioned trust in God. Pujya Mata Ji was born on 21st February, 1923 at Kasoor, District Lahore, now in Pakistan, in Marwaha Khatri family. She was the fourth child among her four brothers and three sisters. Her father, Shri Har Jas Mall was a businessman and her mother Shrimati Maya Devi was a pure religious minded lady and the whole family has having faith in Lord Krishna and his teachings then. Her Father, Shri Har Jas Mall was a businessman and her mother Shrimati Maya Devi was a pure religious minded lady and the whole family was having faith in Lord Krishana and his teachings then. 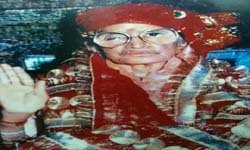 Spiritual personality of Pujya Mata Ji was Being depicted since her birth. On her birth, doctor advised not to feed the child on mother’s milk due to mother’s illness. Her father started to feed her on cow’s milk and Pujya Mata Ji never cried for it. This was the first sign of her contentment about worldly things. When Pujya Mata Ji was of about 9 months, her family members along with her went to the temple of Chintpurani in Himachal Pardesh. On reaching before the sacred entity, as the family was offering the prayer, Pujya Mata Ji was enlightened with the sacred spirit of Goddess Chintpurani and the priest, present there , declared that this child is not a simple one , but blessed with great heavenly powers. All the members of family astonished to listen so. Having experienced so many miracles of Pujya Mata Ji’s power, the family started to regard Pujya Mata Ji as godly mother, even so much so all the family members, including parents and all elders began to address. Her Holiness as “ Mata Ji”. When she crossed the childhood, it is stated by her elders that Pujya Mata Ji used to lock herself in a room for meditation and remained inside the room weeks together without taking anything except a little wter. On hearing the wonderful things about Pujya Mata Ji, the people began to come for her “ Darshan” and for the solution of their respective difficulties. This was a start of the present mission. Copyright ©PUJYA MATA LAL DEVI TRUST(REGD.) Website Designed & Developed By Computer's Galaxy.